What’s the next hotspot? Where will it be? A remote country in the Middle East? In Central Asia? What war will drive the journalists of the world to uncover the story? Will it be the diamond mines in Africa? Will it be simple starvation, somewhere else? Where will suffering suddenly erupt, disturbing the placid waters of the New World Order? Perhaps the silliest of assumptions in the present-day media is the notion of “the story.” There is the idea that unhappiness and conflict represents a sort of brushfire in the landscape of the world—one that the world’s firemen, whether they be U.N. peacekeepers, or U.S. troops, or television pundits, will rush in with their trusty hoses to quell. 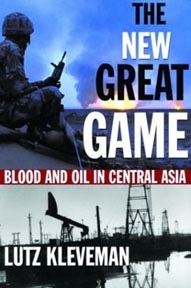 But the fact is, there is a troubled reality to most of the globe, and, as Lutz Kleveman points out in The New Great Game, the angry young men of Al Qaeda make up only a fraction of the rage that threatens all of us. Oil, yes. Kleveman maps out an introduction to the impact of U.S. and international strategies on Central Asia. The area, known in the last century as “the black hole of the Earth,” is an increasingly vital interest to those nations which make up the four percent of the global population but that consume twenty-five percent of global energy. Massive untapped oil reserves in the area of the Caspian Sea make the region a constant focus of international coercion and interference. Kleveman projects that “by 2015 the Caspian region could reach a share of five to eight percent of the world market.” The final result of this apparent wealth in oil is a bevy of damaged states in the area of the Caucasus and Central Asia. Appointed life-long dictator by a rubber-stamp parliament, Niyazov is convinced of his own divinity, and has reinvented his country as a gigantic theme park, with the only theme being himself. Almost every street corner in the capital has multiple portraits of the sixty-year-old stocky man with a soft and somewhat simple face. On some he looks like Burt Reynolds, on others like a genetic blend of Leonid Brezhnev and the German politician Franz-Joseph Strauss. All public buildings were decorated with banners proclaiming the state slogan Halk, Watan, Turkmenbashi (‘One People, One Fatherland, One Leader’). Kleveman brings lucid witness to these incomprehensible realities. Flowing easily from the big picture to the small, The New Great Game dimensionalizes peoples and crises that have often exceeded the reach of popular consciousness.